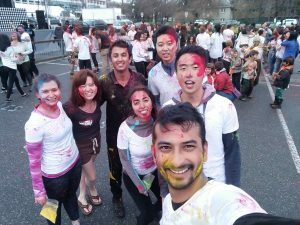 HOLI 2017 – Better than India… Maybe. The sun gleams through between the curtains, the alarm clock is not too far behind. Yes! I am finally awake. For the first time this year, I wake up with a smile and immediately jump out of my bed, skipping the morning coffee and heading straight to change into whites. It’s HOLI! A mythological Indian festival to celebrate the triumph of good over evil, but who cares? As kids all thought about was getting out there and playing HOLI with colour, but why colours? Well that’s the way it is… Everyone in the neighbourhood (friends and families) comes together to the celebrate the festival, putting colour on each other and playing with water. You can’t forget about all the Indian food and music! Most people also take some Bhaang shots before the day starts. Holi 17’ was slightly different, because this time I was in ‘Beau tiful British Columbia’. As I was walking towards the venue of the HOLI festival at UBC, I was wondering how the festival would be. To be honest, I didn’t have high hopes. Was I right? Nope, I was wrong. People turned up in thousands, speakers blaring music to max, food, colour, you name it. It was 4C that morning in VanCity, but who cared. People slipped into their shorts and Ts’ and didn’t complain once when strangers in the party threw water and colour at them. The party only became intense as time went on. It was packed, phew! But hey, that’s what we want parties to be right? Everyone jumping to the beats with half coloured faces, high spirits and enormous amounts of colour in the air. Holi turning into a Rave party, and it was awesome. Thank you to all the MM folks who came along and to UBC for making HOLI 17’ so memorable. And who could forget the Bollywood themed after party too! This entry was posted in Life at UBC/Vancouver, Other and tagged Balance, CulturalCelebration, International, Social, Student Life. Bookmark the permalink.